Our friends at Autoblog caught a glimpse of the trunk of a 2015 Mustang concept peeking out from underneath a sheet in Las Vegas. I won't post it here because it's not my picture to use, but that trunk very clearly says "KING COBRA" on it. And that is magnificent. Ford hasn't used the King Cobra name since disco was a legitimate form of entertainment and they haven't used Cobra in a decade. Other than the name, we know nothing at all about this car, but we think it could be an SVT one-off of some sort. We'll find out at SEMA soon enough. I just hope it's heavy on ridiculous graphics. That would make me ever so happy. 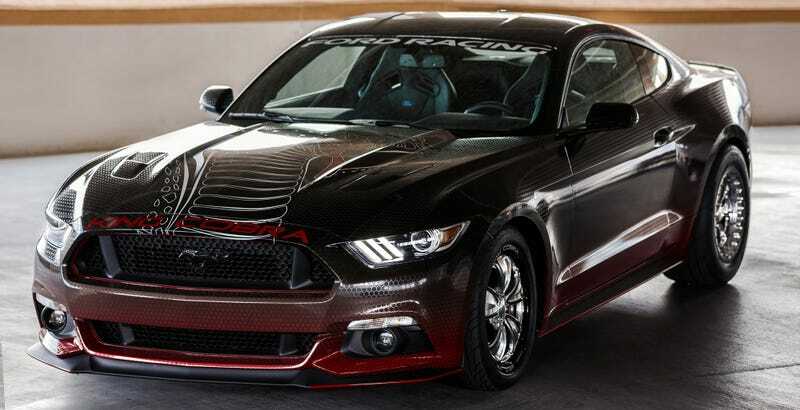 Update: Looks like the first photos of the new Mustang King Cobra have dropped on Ford's website. No other details at the moment, but the scale-y gradient paint job looks interesting. More information as we get it.